The placenta is known for its high contents of stem cells and growth factors which together heal damaged tissue and organs at an incredible rate.Â Growth factors called cytokines stimulate cell division, the making of new cells, which is essential when healing, repairing and regeneration of damaged tissue. 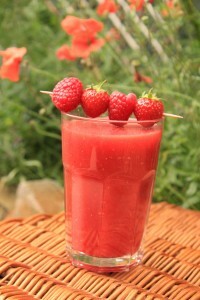 The benefits of having a placenta smoothie soon after birth. I am sure there are many of you reading this right now thinking, â€œewww, grossâ€, and thats understandable, after all we are talking about eating your placenta. A placenta smoothie doesnâ€™t mean whizzing up the whole placenta as many people assume. It is in fact a smoothie with a walnut size piece of placenta added. Once a mother has decided to do this with her placenta there is a visceral longing to drink it.Â The effects are fairly instant, and the colostrum becomes darker within a few hours. It makes an interesting feeling of excitement both instantly and over the next few hours. A great placenta smoothie for boosting your immune system weakened by a difficult or long labour and after intervention or c-section births. 50-150ml of water. Add more or less liquid depending on the consistency you want. This smoothie is high in vitamin A, vitamin C, fiber, iron, manganese, magnesium, and potassium. This is one of my most recent placenta smoothie recipes.Â It was thoughtfully put together for a client who wanted ground quinoa adding and spinach. She loved it! All smoothies should be consumed within 1 hour.